Successfully Added Wireless Stereo Transmitter for IPOD to your Shopping Cart. Stereo A2DP and AVRCP transmitter for listening to your IPOD music while on the go. This is an easy to use product with a simple function, allow you to listen to the music on your IPOD product through your bluetooth earphones, speakers, laptop, etc. Simply insert the transmitter into your IPOD product and then pair it with your A2DP and AVRCP capable earphones or speakers and you will instantly start enjoying your music. This is a perfect item for the person on the go. A wonderful little product that is offered to you at a low wholesale cost and with no minimum order quantity (M.O.Q.). From the leader in direct from China electronic products, Chinavasion. Stereo Transmitter for IPOD - listen to your MP3's wirelessly. 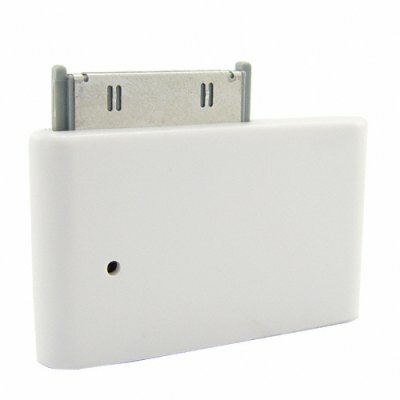 Has standard 30-pin IPOD connection adapter for IPOD, Nano, Mini, Video, Photo, etc.